I would encourage any VIP to get involved in this beautiful sport as a tandem partner. I find cycling not only a physical sport but a mental one too and can be challenging to push your body, however I enjoy the time to reflect on my week and translate my thoughts when riding socially. I participated in the sport of cycling as an individual until the day I decided to ask a friend to participate in the 2015 Momentum 94.7 cycle challenge. Originally, she declined my invitation but instead gave me an ultimatum that if we were going to cycle the Momentum challenge, we had to participate as a team on a tandem road bicycle. I happily obliged and considered it an exciting prospect. We rode the race with no practice on the tandem bicycle and actually thoroughly enjoyed the experience. My tandem partner was a novice and I encouraged her not to worry, as long as we communicated we would be just fine. We conversed continuously throughout the race discussing directions, body-weight transferring, and braking, accelerating and changing gears. This helped our ability to navigate and ensure we were stable at all times. We sure did have a weight advantage over the individual cyclists on the downhills and managed to clock some high speeds (+-90km/h). 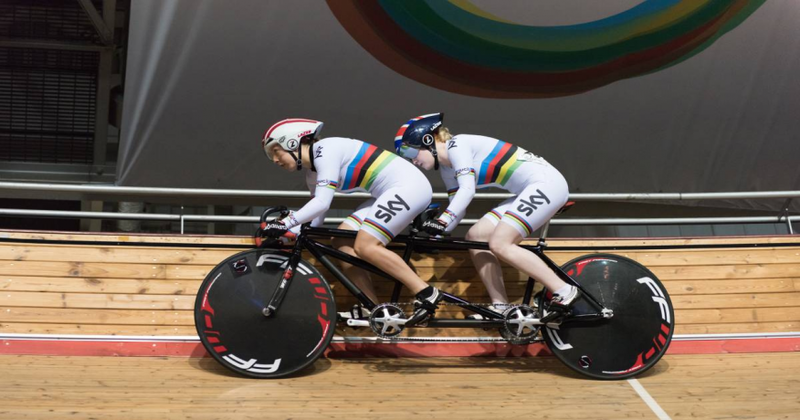 Image: Two tandem cyclists (one sighted and the other blind) training indoors on a fixed bike with a guide-dog resting on the floor. I have seen VIPs participate in the sport, but I know little about the sport from a blind perspective. I am not sure as to how different it would be for a sighted person to accompany a visually impaired cyclist on the back of a tandem; but I believe with a good amount of communication between pilot and passenger regarding the whereabouts and movements of others and yourselves, it would be a very manageable sport. I would encourage any VIP to get involved in this beautiful sport as a tandem partner. Solid teamwork, reassurance and communication would be the components that I suggest you practice with a teammate before attempting to cycle together.